If you are injured in a slip and fall accident in Naples, it is quite possible that the responsibility for that accident may rest with another person or corporation. People typically don't slip and fall unless there is a reason - and sometimes that is caused by someone else's negligence. 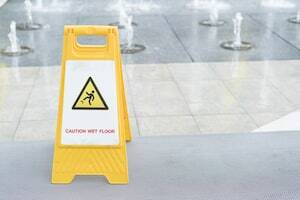 Spilled liquids, clean but slippery floors, uneven surfaces, and debris on the floor are common causes of slip and fall accidents where some other party may be responsible. When you slip and fall, and are injured somewhere other than your home, chances are someone owed you a duty of reasonable care. If you are in a restaurant, supermarket, mall, hotel, resort, public space, the person or company who controls and manages the premises is legally responsible to secure and reasonably make safe the environment for visitors. When this duty is breached due to negligence, that party may be liable to pay for your injuries that have occurred consequently. To determine if you are eligible for compensation after your slip and fall accident, you should speak to the best Naples slip and fall lawyer you can find. Our Naples slip and fall attorneys at the Wolfson Law Firm can help. We help good folks obtain the compensation they deserve. We have been doing this in Florida since 1963 and we are ready to help you too. You can reach us for your free and confidential consultation at 239-777-9954. The City of Naples is a city with the second-largest concentration of millionaires per capita in the whole country. That makes for a high median family income, which is at $102,000 and high income per capita for the city at $61,000. Some large companies serve as major private employers for Naples residents, such as Health Management Associates and NewsBank, but most of the people earn their income from the ecotourism business. Many tourists visit Naples for its closeness to the Everglades and the Ten Thousand Islands. They attract many tourists who enjoy ecotourism, allowing many people from this small city to benefit financially. However, Naples is known for its pristine beaches as well. In 2005, it was voted the city with best beaches by the Travel Channel. The most famous beaches in Naples include Naples Municipal Beach and Fishing Pier, Vanderbilt Beach and North Gulf Shore Boulevard Beach. Naples is easily reachable from Tampa, Fort Myers, and Miami via Tamiami Trail and the Interstate 75 (I-75) Highway (also known as Alligator Alley). It borders only with two urban areas - North Naples is on the north, and East Naples is on its eastern border. Our Naples slip and fall attorneys at the Wolfson Law Firm work hard to build a strong case before negotiating with the potential defendant and their insurance company. Once we gather all the necessary evidence that proves your injuries are due to the negligence of another, we will send a settlement demand package to the insurance company. If they accept, your case will be resolved very soon, and you will receive just compensation. If they refuse the offer, delay the response, or are unresponsive, we will file a lawsuit and, when necessary, go to trial to fight for you. Our consultations are free and no-risk. You can reach us at 239-777-9954 at any time. You won't pay us fees unless we get you compensated for your injuries. The Wolfson Law Firm is located at 3049 Cleveland Ave #140, Fort Myers, FL 33901 and serves the communities and towns of Collier County including Naples, Golden Gate, Ave Maria, Everglades City, Lely Resort, Marco Island, Goodland, Orangetree, Vineyards, Immokalee, Pelican Bay, Pine Ridge, Chokoloskee, Naples Park, Verona Walk, Island Walk, Lely, Naples Manor, Plantation Island, Ochopee, North Naples and East Naples.